WHERE are your House Concerts? We live in Oak Park, California, near the cities of Agoura Hills, Westlake Village and Thousand Oaks... only 45 minutes northwest of Los Angeles, in southeastern Ventura County. We are just music fans who started doing this because we love to be able to share great music with others. In our everyday lives, we are the owners of a graphic design company. Please note: "Russ & Julie's House Concerts" is simply the name we picked to describe our private parties. These parties are NOT a business nor are they a business related activity. They are strictly a hobby for us, and are simply gatherings of our friends and guests to enjoy live acoustic music, fellowship, food (a potluck dessert buffet) and fun. Our concert parties are officially free (or else it might be considered a business), although voluntary contributions (suggested donation of $20 per person) are accepted at the party on behalf of the artists. 100% of all contributions go directly to the performers. By invitation only. Many of our House Concerts fill up a weeks in advance, so please RSVP early. Are you a musician looking for a venue to perform at? We are booked solid through all of 2019... and we have a huge backlog of performers that we are trying to work into our schedule. Thus, we are NOT accepting any new booking suggestions at this time. We only host about 10 to 12 shows per year and we currently have more than 100 artists on our list of people that we hope to host a House Concert for sometime soon -- not to mention about 250 past performers who would like to return! -- so we are more than a little overwhemled right now. Thank you for your interest. Childhood sweethearts Russ & Julie Paris are music fans, hosts and supporters. Founders of Russ & Julie's House Concerts in early 1997, they have been hosting monthly House Concerts for more than 21 years now -- more than 230 shows. Among those who have performed at Russ & Julie's House Concerts are Jim Messina (Buffalo Springfield/Poco/Loggins & Mesinna), John McEuen (Nitty Gritty Dirt Band), Chris Hillman (The Byrds/Manassas/Flying Burrito Bros.) & Herb Pedersen (Desert Rose Band/Laurel Canyon Ramblers), Mary McCaslin, Severin Browne, Laurence Juber (Paul McCartney & Wings), Penny Nichols, Lowen & Navarro, Karla Bonoff, Wendy Waldman & Kenny Edwards, James Lee Stanley, Barry McGuire, Caroline Aiken, Ellis Paul, Darryl Purpose, Doug Haywood, Laurel Masse (Manhattan Transfer), Van Dyke Parks, Rosemary Butler, Bill Payne (Little Feat), John Hall (Orleans), Steve Gillette, The Kennedys, Iain Matthews, Laura Love, Artie Traum, Ronny Cox, Janet Robin, Wayne Kramer, Jon Pousettte-Dart, Marshall Crenshaw, A.J. Croce and Andrew Gold. In their efforts to promote live music performance, Russ & Julie have helped other House Concerts get started and have promoted folk and acoustic concerts in the area. Their publicity efforts to spread the word about House Concerts have resulted in their being featured on KCBS Channel 2 News for a "Special Assignment" story on House Concerts in March 2001 and on NPR's "Marketplace" for a story on house concerts in February 2002, where Russ & Julie were interviewed along with Darryl Purpose and Dar Williams! Russ & Julie's House Concerts has also been featured in the Los Angeles Times, The Ventura County Star, The Acorn, The Conejo Valley Examiner, FolkWorks, Ventura Life & Style Magazine, Connected Magazine, Stereophile Magazine, The Lefsetz Letter and other local and regional publications. Most recently, the Ventura Country Reporter listed Russ & Julie's House Concerts as "Best Intimate Folk" in their 2012 "Best of Ventura County" issue and in January 2013, the Christian Science Monitor featured Russ & Julie's House Concerts in an article. Russ & Julie were on the formation committee for Folk Alliance Region West (FAR-West), the western regional chapter of Folk Alliance International. FAR-West's mission is to strengthen the ecology for folk music and build stronger artists, presenters and audiences. Working with local folk luminaries like Howard & Roz Larman (of Folkscene Radio), Elaine & Clark Weissman (of the California Traditional Music Society), and Steve & Leda Shapiro (of FolkWorks), they helped to start what has become one of the leading acoustic music conferences on the west coast, bringing hundreds of musicians, venues, DJs and other music industry people together each year for networking, performance and education. Russ & Julie have both served on the Board of Directors of FAR-West for a number of years. Russ has been secretary of the organization and Julie has served as both Treasurer and Conference Coordinator. They both work tirelessly behind the scenes to make FAR-West a success and to spread the opportunities for live acoustic music on the west coast. In May 2013, Russ & Julie were honored with the annual "Legend Award" by the Topanga Banjo-Fiddle Contest & Folk Festival joining past award recipients like Bob Stane (The Ice House / Coffee Gallery Backstage), musicians Ross Altman, Richard Greene, Peter Feldmann, Bess Lomax Hawes, Sam Hinton, and their FAR-West co-founders Howard & Roz Larman (of Folkscene Radio), Elaine & Clark Weissman (of the California Traditional Music Society), and Steve & Leda Shapiro (of FolkWorks). 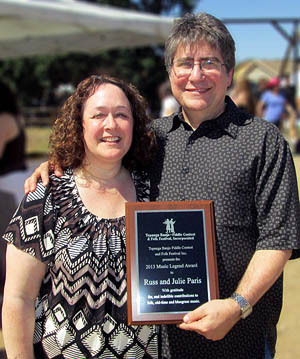 In October 2015, Russ & Julie received the 11th Annual Folk Alliance Region West (FAR-West) "Best of the West" Amabassador Award at the annual FAR-West Music Conference in Oakland, CA. This award, presented annually by the FAR-West Board of Directors, has been previously given to Bread & Roses, The Ash Grove, Freight & Salvage, Howard & Roz Larman of FolkScene, Bob Stane of Ice House/Coffee Gallery, and Cloud Moss of Kate Wolf Memorial Festival not to mention musicians like The Kingston Trio, Chris Hillman, Barry McGuire, John McEuen, Laurie Lewis, Utah Phillips, Rosalie Sorrels, Joe Craven and Lowen & Navarro among a number of others. Russ & Julie have volunteered at CTMS festivals, L.A. Acoustic Music Festivals, and can often be found taking tickets or selling CDs at house concerts and music venues around the area. They try to find time to dance quietly in the back at each house concert they host and say that they do it all for the love of the music.